Jim arranged the walk to be completed over six days. 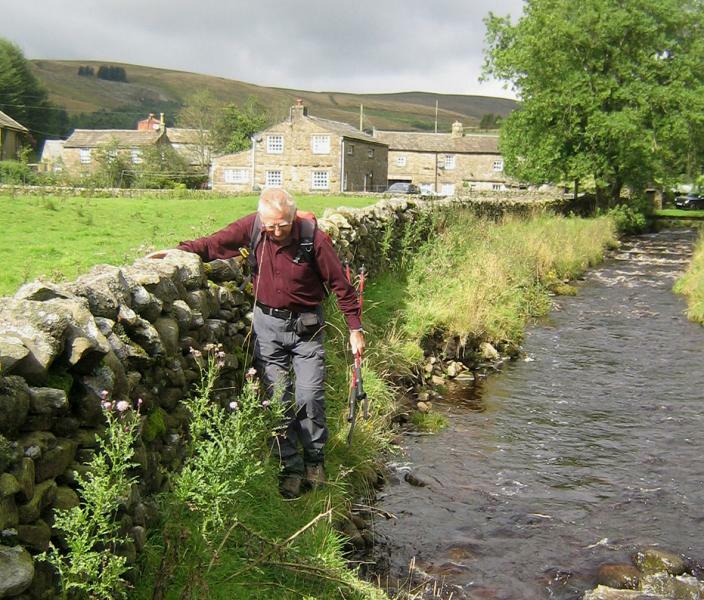 In the event only three members were able to join Jim so he organised B & B accommodation based on three centres, three nights near Ripon, two at Aysgarth and one at Hawes. We were to use two cars to shuttle to and from each section of the walk. 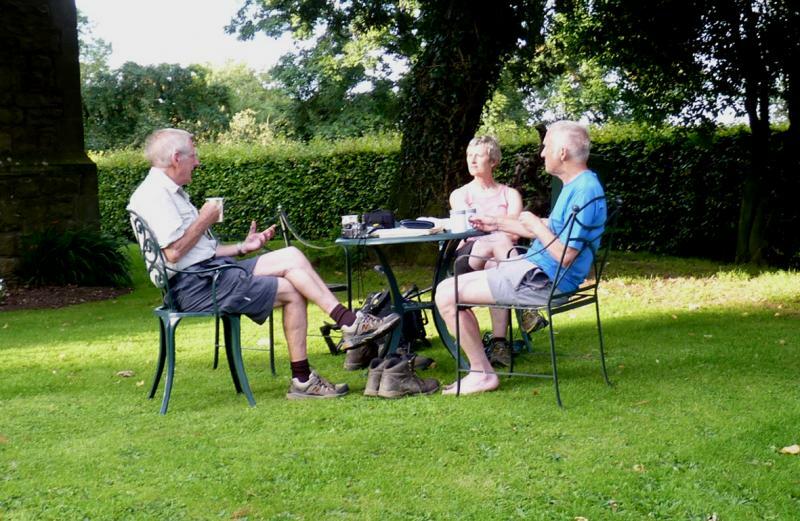 On the evening of Wednesday 5th September Jim, Barbara Young, Derek Heatherington and Barrie Blenkinship met at the Moorhouse guesthouse at Kirkby Malzeard near Ripon. After enjoying a substantial meal at the adjoining Drovers Inn we retired to our rooms to prepare for an early start next morning. 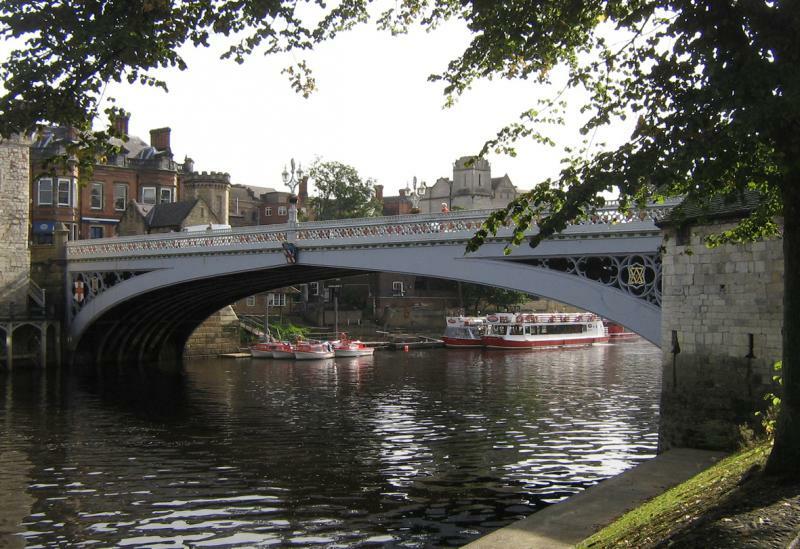 After a hearty breakfast we headed for York via our cars and Park & Ride into the city centre. It was sunny and warm and tourists thronged the streets, no doubt looking for coffee shops before exploring the city sights. No coffee for we four though, instead we dropped down to the River Ouse leaving the crowds behind to begin our long walk to Kirkby Stephen. We walked alongside the Ouse for six miles or so in the company of colourful river craft keeping pace with us as they cruised upstream. Their occupants sat aboard in the sunshine drinking more exotic liquids than that contained in our water bottles. We left the Ouse at Benningborough to pass Benningborough Hall and through its extensive parklands to reachNewton-on-Ouse. We had a brief pause here at the Dornay Arms to refuel with huge sandwiches etc. Our route now took a wide detour on good tracks and lanes to skirt around RAF Linton-on-Ouse airfield. We were treated to a free air show as trainee pilots circled and practised taking off and landing. After Aldwalk we followed paths across farm land into a boggy wood where we each hunted for the best way through. When we eventually re-grouped those who had found the correct path had also found dense nettle beds; whereas the one who trespassed emerged unscathed! We eventually arrived at Ellenborough and now joined the path beside the River Ure which we were to follow for the next 75 miles. It was then but a short stretch into Boroughbridge and the end of our first day. After another “Full English” and a little car shuffling we returned to Boroughbridge on another sunny, warm morning. We left the town on a path which passed the Devil’s Arrows, three pillars of millstone grit thought to have been erected in Neolithic times. After passing under the manic A1 and into peaceful Rowcliffe village we found ourselves back beside the River Ure. This stretch of the riverside path was one of the highlights of the walk; idyllic scenery, narrowboats and an exceptional view of Newby Hall and Gardens all bathed in sunshine across the river. The next couple of miles followed the quiet Ripon Canal into the old market town. We enjoyed watching more narrowboats negotiating the locks between the Ure and the canal. We paused in Ripon to admire the magnificent Minster and to have a leisurely lunch in the garden of a café. From Ripon the Yoredale Way was shared with the Ripon Rowal Way which diverged from the river to cross farmland, field paths and farm tracks to rejoin the Ure near West Tansfield. We followed the river as it meandered through meadows and woodland to reach pretty little Mickley and then into Hackfall Woods. The path wended its way up and down the side of the wooded gorge with views of the river dashing through below. We were eventually guided away from the Ure by a short stretch along the River Burn before climbing uphill into Masham along footpaths which took us directly to the town centre. After another car shuffle it was back to the Moorhouse and Drover’s Inn for a very late supper. After checking out of our superb Moorhouse B & B we headed back to Masham to begin the next section. Again we were blessed with warm sunshine as we started the day in a civilized way by sitting in the marketplace with a cup of coffee. Masham was bustling as it was both market day and Masham Show day. Sun lotion was applied before we set off again along the river which was sometimes nearby and at other times more distant, but always in sight. 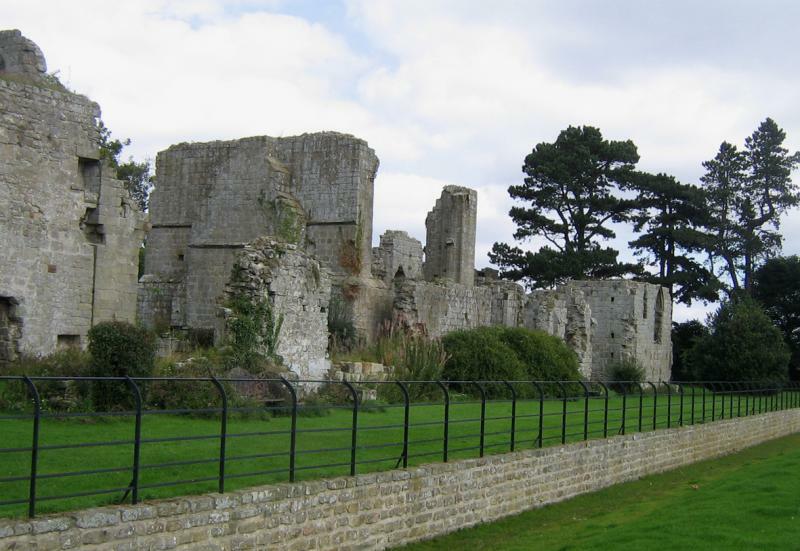 It was a beautiful walk to Jervaulx Abbey which was very ruinous but had an excellent open-air café where we enjoyed tasty Masham pork pies and home-made cream teas. From Jervaulx we were back alongside the Ure to Cover Bridge and its Inn, an ancient gathering place for would-be warriors on the way to war. 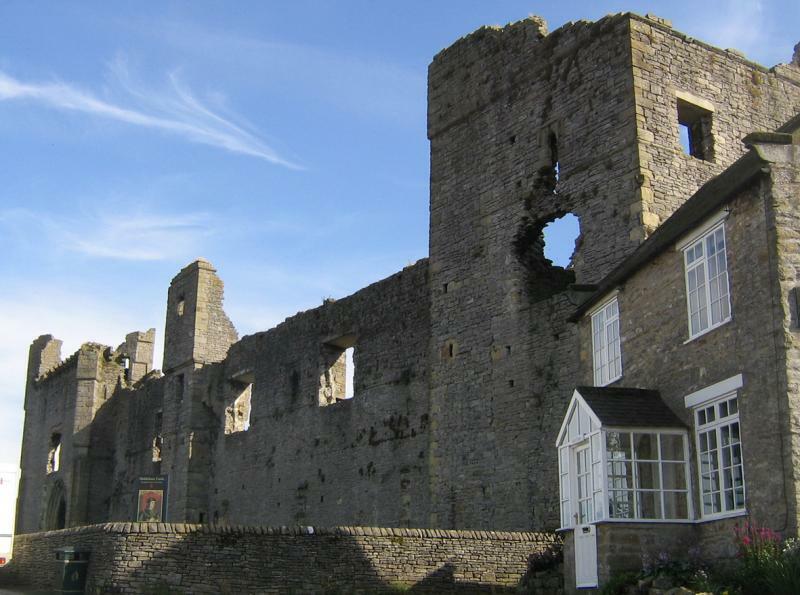 After following the River Cover for a short distance we turned away towards Middleham. 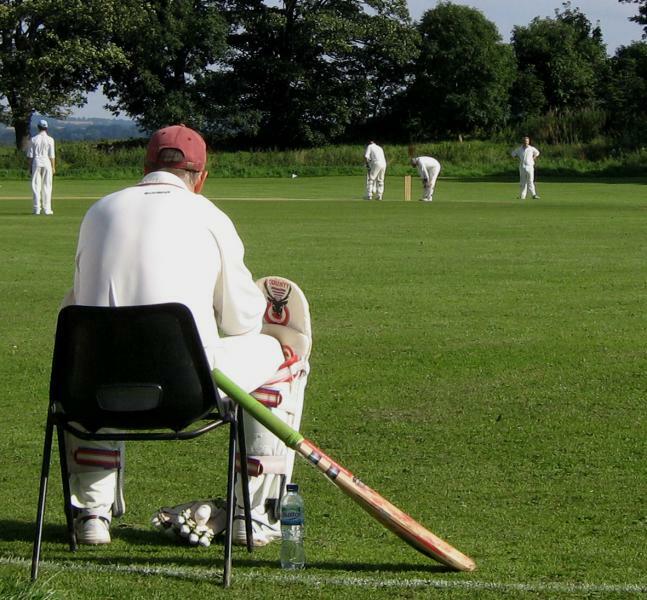 As we approached the village we paused a while to watch a cricket match taking place near the ancient castle. Sadly we didn’t have time to explore but instead bought ice creams to enjoy sitting around the market cross. It was then only a short stretch of road walking before crossing Middleham’s mock suspension bridge and a field path which took us into Leyburn. After another car shuffle we moved on to Stowe House at Aysgarth, our next B & B bringing to an end a hot but shorter day. We left Leyburn on another sunny, warm morning and headed for Leyburn Shawl, a high limestone edge overlooking upper Wensleydale with the river Ure below. The view was delightful across the dale to Pen Hill, the first mountain on theYoredale Way, which we were to visit later in the day. Soon we left the Shawl and dropped down into the dale to cross the river at the picturesque village of Wensley which gives its name to the dale. This is apparently the onlyYorkshiredale not to be named after its river. The path followed the Ure upstream for a mile or so before turning to West Witton where we had lunch in the beer garden of the Fox and Hounds. Suitably fortified it was now onwards and upwards to reach Penhill Beacon. After stopping to admire the view we moved on along the ridge of Pen Hill, and then as we began our descent the sky darkened and we had the first rain of our walk. However, no sooner had we donned our waterproofs than the sky cleared and the sun reappeared. 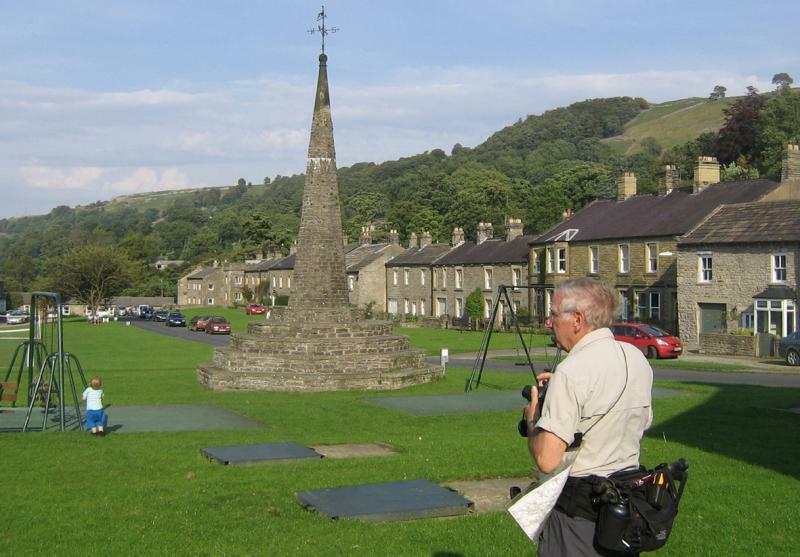 An old drove road then took us down to West Burton with its large village green and unusual spire cross. 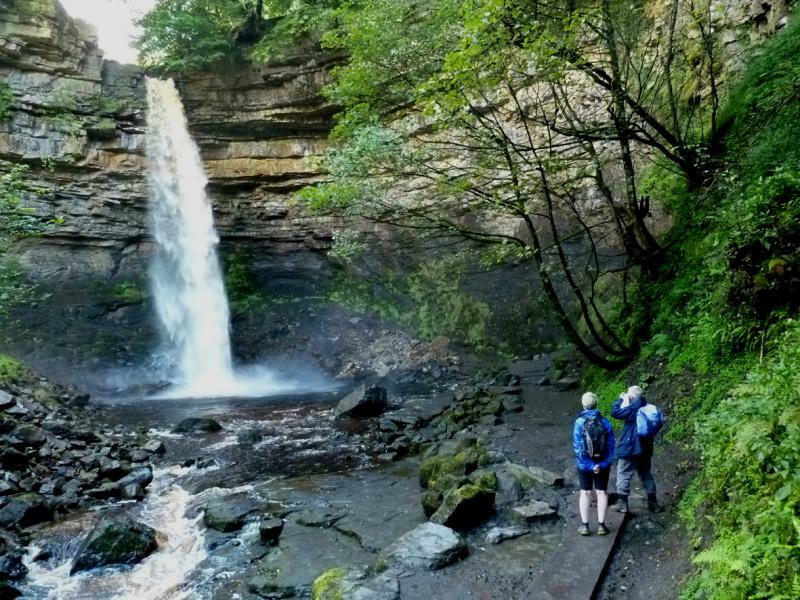 A brief detour was made to visit Walden Beck Falls before a short but steep climb to reach Aysgarth. The footpath emerged at a stile directly opposite Stowe House where we enjoyed a relaxing half hour on the lawn in the afternoon sunshine. Before we started walking today we packed and transferred to Fairview Guest House at Hawes, our last B & B on theYoredale Way. It was mid-morning when we drove back to Aysgarth and headed down to the River Ure once again. We followed the river upstream passing Aysgarth Falls and then followed a disused railway track below Nappa Scar. No sun today, it was overcast with brief light showers so when we reached Askrigg we were pleased to have our coffee and scones at an indoor café for a change. Continuing on again towards Hawes we visited the secluded waterfall at the head of Mill Gill which we shared with an excited group of schoolchildren from Pendle. The Way then followed field paths and lanes above the narrowing upper Wensleydale valley. The River Ure now flowed more energetically when we crossed it again before passing the Dales Musem at Hawes to arrive at our B & B nearby. After settling in we explored Hawes and had an excellent meal at the White Hart. Our last day began bright and sunny but cooler. We had become accustomed to warm sun as we walked through Yorkshire but as we neared Cumbriat he weather was changing. From Hawes we headed back alongside Gale Beck to where it joined the Ure and crossed fields to reach Hardraw. 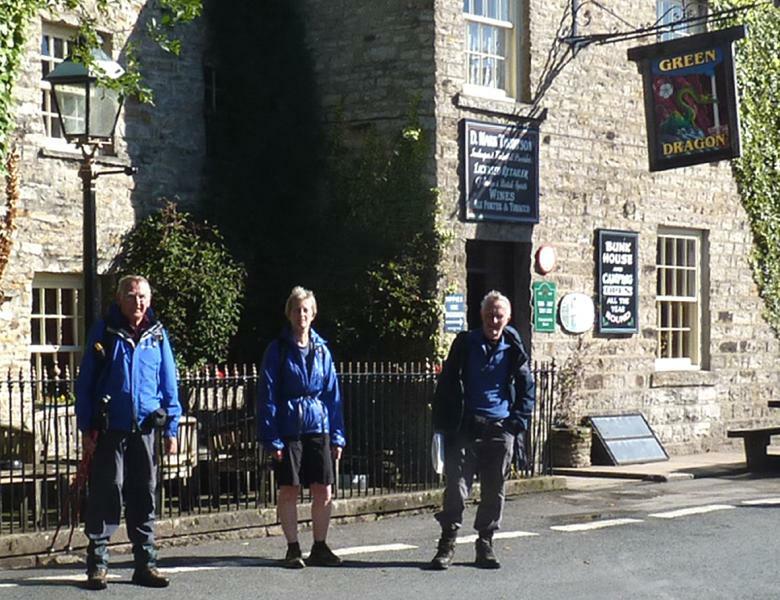 We passed through the Green Dragon pub having paid our £2 to visit Hardraw Force, the alternative had been to buy a drink but it was too early in the day for us! It was well worth the fee as after heavy overnight rain the torrent was spectacular. Back on track we followed the Pennine Way as it began its climb up to Great Shunner Fell. Before long we turned away and began our descent to the tiny hamlet of Cotter hidden away at the head of Cotterdale. Then it was upwards again to Cotter End where we ate our lunch in the shelter of a crag with a superb view down Wensleydale. Amidst heavy, but thankfully short, showers we began the last stretch of the Yoredale Way along the High Way above Mallerstang. This is the track used by Lady Anne Clifford in the 17th century when she travelled north between her castles at Skipton and Appleby. Below us the River Ure was little more than a beck as we drew nearer to its source high above Mallerstang at Ure Head. We were soon to meet the Ure for the last time, but to cross it now was no more than a stride. It was then goodbye to the river we had joined 75 miles away with its wide stretches and colourful narrow boats. 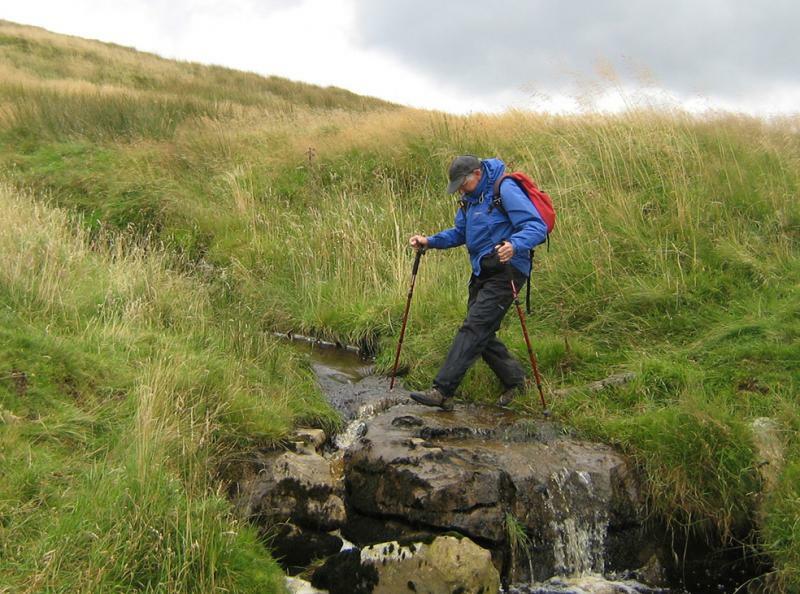 We continued on to cross the infant River Eden and pass the first of the Eden Benchmarks called “Water Cut” on the way down into the Mallerstang valley at The Thrang. 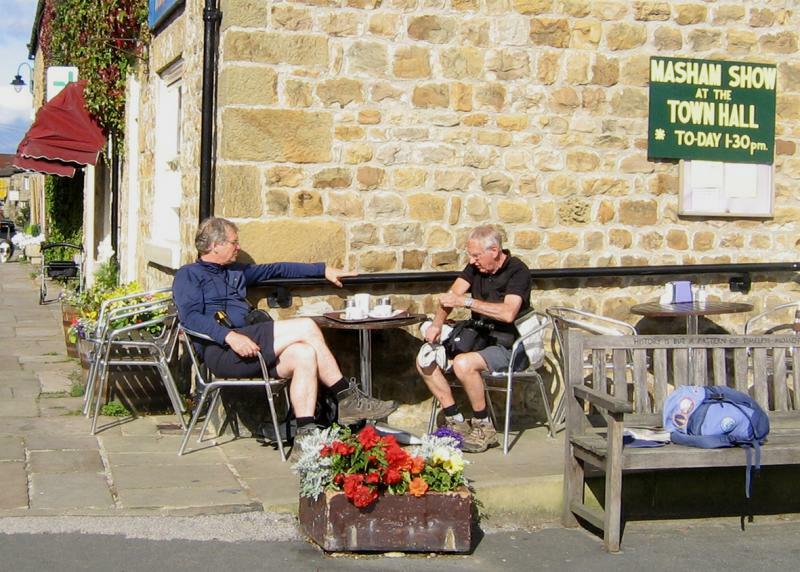 While Barbara and Derek carried on to finish at Nateby, Jim and I returned to Hawes by car to collect our baggage and the second car. On the way back we enjoyed a pint at the Moorcock Inn and then headed back to Nateby to meet Barbara and Derek. That was the end of our Yoredale Way although the official end is five miles further on at Kirkby Stephen. It had been a superb walk and the accommodation selected by Jim had been excellent. The mainly warm sunny weather has been the icing on the cake.